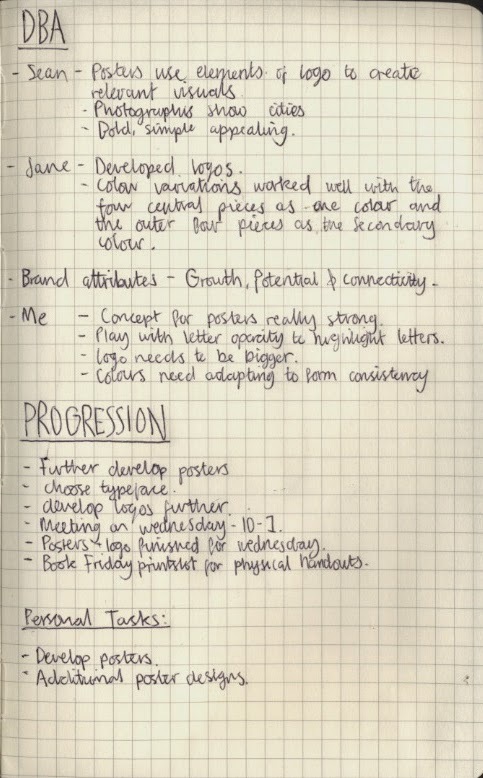 Today we had a progress criticism to review the work that people have produced throughout last week. In the previous session we divided the workload between the group, leaving three members to develop concepts and visuals for the posters and with the remaining two members focusing on finalising the logo and choosing colour schemes. 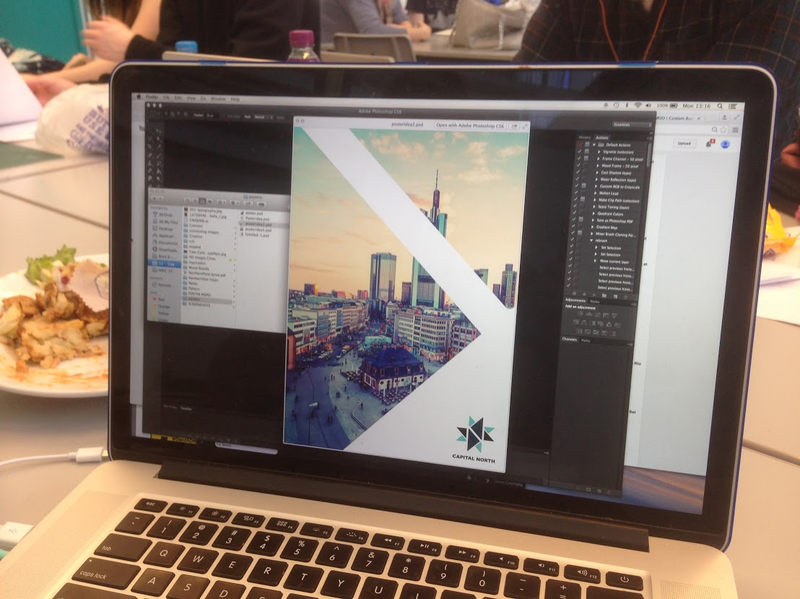 Sean - Posters use elements of logo to create visuals. Photographs are placed within the shapes showing a city scape/scenery. Posters are bold, simple and appealing. Jane - Developed logo variations & played with colour and type. Colour variations worked best when the central pieces of the logo were rendered in one colour with the remaining four pieces utilising a secondary colour. Me - Concept for the posters is really strong. Play with letter opacity to highlight the individual city names. 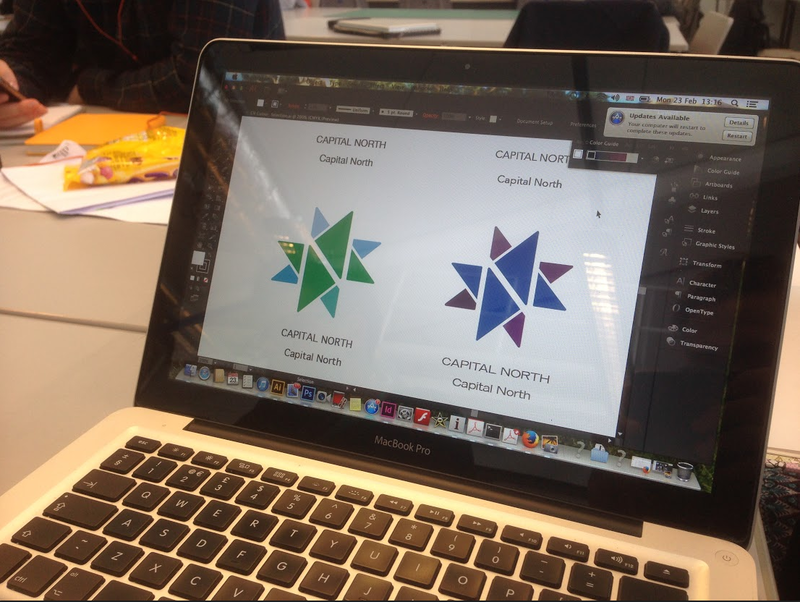 Capital North logo needs to be bigger & more noticeable. Colours need adapting to form consistency with the rest of the campaign. Jane's two most successful logo variations. To help us progress from the session we made a list of tasks that need completing before Wednesday, the day on which our next group criticism will take place. As the deadline for the brief is fast approaching we decided to step up our commitment this week with the overarching aim of having the project finished for Friday. Choose typeface and final colour scheme. Posters and Logo should be finished and selected on Wednesday. Book print slot for friday to print physicals for the monday presentation.